masoor dal recipes | Indian masoor dal recipe, split red lentil recipes. Masoor dal is basically split lentil without skin and is red in colour. It does not need soaking prior to cooking as it is a soft dal and cooks quickly. When cooked, masoor dal turns a soft golden colour and has a pleasant earthy flavour. With 26 per cent protein, these lentils have the third-highest level of protein, by weight, of any plant-based food after soybeans and hemp. 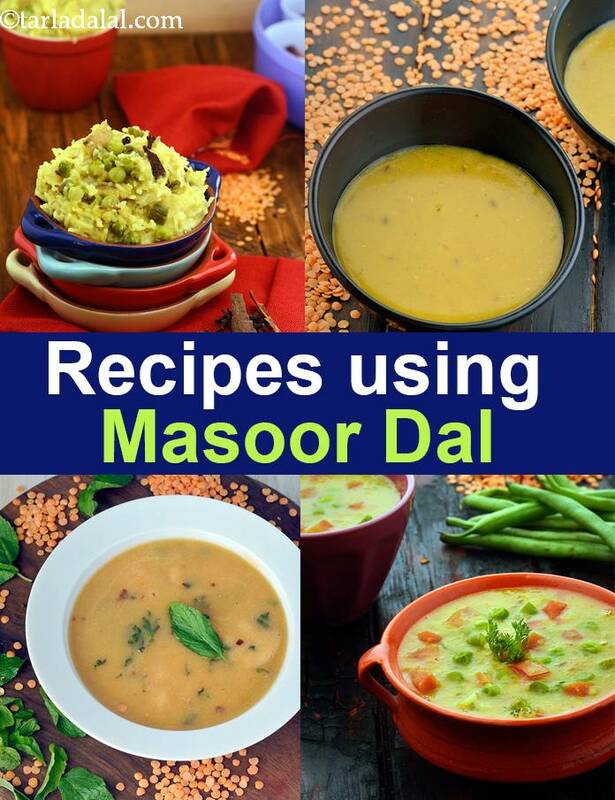 Masoor dal is used in Indian cooking for making dals, healthy masoor dals, khichdi, soups, baby dal recipes, dosas, tomato rasam. Masoor Dal used in making dals. Enjoy this easy masoor dal recipe made which is cooked in a pressure cooker. This Masoor dal recipe is one of the recommended foods for those undergoing dialysis. The restricted salt content also makes this dal recipe suitable for those with high blood pressure. Chawli leaves added to masoor dal make a pregnancy friendly chawli masoor dal recipe. Chawli is one of the richest sources of iron and vitamin A and ideal for pregnant women. The popular dal fry recipe is made of masoor dal and yellow moong dal. With five protein-rich dals, this spicy mixed dal recipe version combines curds and traditional spices to give a tangy, spicy, delectable accompaniment for parathas and rotis. This dal can be prepared easily and quickly, but remember to soak them together for an hour to ensure uniform cooking. Looking for a more filling dal, then try masoor dal with mixed vegetables. Those wanting to cut fat in their diet, can try our suva masoor dal recipe with zero oil. masoor dal goes well in healthy Indian soups. This garlic masoor dal tomato soup recipe is healthy low calorie protein rich soup. Try this Bombay curry soup recipe with spinach which is powered by masoor dal and a very soothing soup when you are feeling a bug. A nourishing liquid food that is perfect for weaning your little one, Masoor Dal Water has a texture quite like mother’s milk, which increases the chances of its acceptance by babies. When you start weaning your baby, strain the dal water as babies cannot digest whole pulses at this stage. At month 8 or 9, you can start giving it without straining. Mixed sprouts and chana dal tikki uses both masoor dal, chana dal with some added paneer. Also use of pulses makes this recipe high in fibre and iron. Masoor Dal (split red lentils) : 1 cup of cooked Masoor dal gives 19 grams of protein. Being rich in Phosphorus it works with Calcium to build our bones. Masoor dal is rich in Folate, Vitamin B9 or Folic Acid which helps your body to produce and maintain new cells, especially red blood cells. Masoor dal is is good for diabetics and a healthy heart. See detailed 10 health benefits of masoor dal. Enjoy our masoor dal recipes | Indian masoor dal recipe, split red lentil recipes. below. Suva masoor dal, a perfect combination with steaming rice, this low- cal spicy dal is perfect to get back to pre-pregnancy shape. Dill leaves and garlic add flavour and iron, turmeric is a well-known anti-bacterial agent, while masoor dal strengthens muscles which become weak after delivery. An indian-style soup for the desi palate! together with slightly-buttered toasted bread, this is sure to comfort and warm you up on even the gloomiest of winter days!